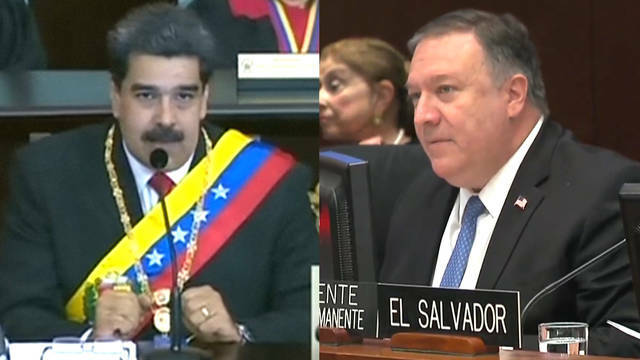 How Washington’s Devastating “Economic Blockade” of Venezuela Helped Pave the Way for Coup Attempt; Venezuelan Foreign Minister: The U.S. Interferes in Latin American Politics Every Day, Every Hour; Breaking: Birmingham Civil Rights Institute Reaffirms Award for Angela Davis; CodePink’s Medea Benjamin Disrupts Pompeo Speech to Denounce U.S. Regime Change Agenda in Venezuela; Historian: Venezuela Is “Staging Ground” for U.S. to Reassert Control Over Latin America.